Once upon a time, a long time ago, when I thought I would never be able to bake well, someone told me that making "biscoitos de polvilho" was a impossible mission. One of my grandma's friends told me that I had to have lots of patience and time. And sometimes even some good luck. On a wet Tuesday afternoon that seemed to be what I had: Time, patience, tapioca flour (from Bob's Mill) and luck to be in the mood to bake. I thought that maybe the four boys would get interested to play with the supposed to be very gooey mix - something like white glue papier machê- and make shapes with them while squeezing the dough out of the bag. It didn't happen. But the three of them couldn't stop eating the crunchy, savory and irresistible sticks as they came straight from the oven. Darienne was the perfect partner to make those crazy shapes. This recipe is adapted from the original by Dona Maria José da Silva, a Brazilian wise lady who specializes on making all sorts of baked goods, from crackers to cookies. During the whole process I was puzzled by the texture of the batter, and even dared to play with some ingredients, adding less milk than recommended and jazzing it up with some spices. The result was great. On the next day, best friends arrived from Brazil for a short visit - and were happy to try those, which were served as a starter for a very long and delicious lunch. 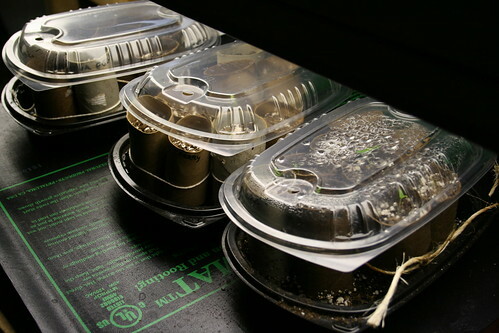 You can store in a sealed plastic bag for about a couple of days. This recipe makes about 100 sticks or less, depending on how wide is the cut you make on the tip of the plastic bag. Pre-heat oven to 390 F. In a very large bowl, mix tapioca flour, salt, oil and cover the ingredients with boiling water. Stir with a wooden spoon. When cool enough to the touch, start kneading the mix with your hands. When the mix is looking even - but coarse - add egg and then milk little by little, using your hands to mix. If it gets too liquid, keep adding more flour up to when it looks like it's going to keep a texture to be squeezed from bag.You can add the garlic and the Parmesan after baking half of a batch without them, so to taste the whole tapioca as it is. Transfer fair amounts of batter to a plastic bag and make a small hole in it. Line baking sheets with silicone liner and distribute the stripes of dough in the manner you wish. Bake the sticks for about 20 minutes or more, up to when golden. Let them cool down for a while and enjoy! So, what if a kid-crocodile wakes up in the mood for eating a child? Maybe he will have a banana. Maybe he won't eat anything! Right? Maybe. Here's a big thanks to this creative writer, who wrote this quirky and hilarious book that may raise your kids' appetite for a banana or banana inspired recipe! 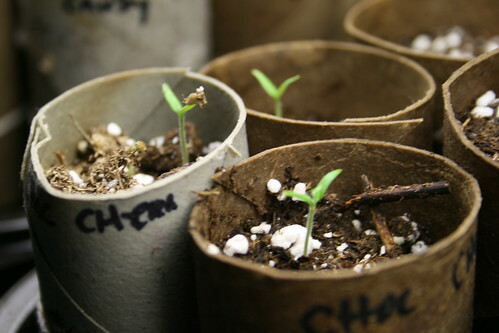 Or maybe, really, anything edible to make him/her to grow up. This is one of my kid's favorite book. I'd Really Like to Eat a Child, by Sylvianne Donnio, was given by Darienne to one of my kids, two years ago, as a birthday gift. They always have a blast reading it. And when I am upset by their sporadic hunger strike (yes, believe me, they all do have a period to refuse to eat), this is the book I read to my kids. So, last time I was looking for inspiration for the Cooking Club at school, I found it in this story. The initial idea was to make some healthy bites that would include banana and other ingredients to make a kind of surprising "candy." 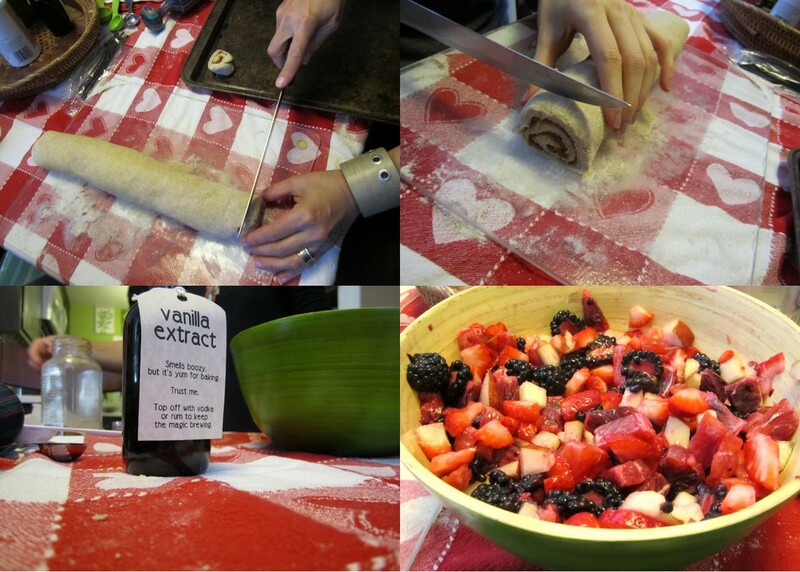 The first time we tried to develop the recipe was during our playdate with our four boys. They again enjoyed listening to the story, read by Darienne. After that we all played with making the dough, and coating the little balls with chocolate sprinkles, white chocolate chips, and even rice crisps. Some thought the mix was too gooey and baby food-like. Others enjoyed the whole process and the product. At school, for the Cooking Club, I added another step to the recipe: with a toy hammer, kids had the chance of smashing a bag full of vanilla wafers to turn them into crumbs. We also swapped the original extra cup of oatmeal for nice, crisp granola. This gave more texture to the bonbons so that we didn't even have to bring them to the fridge to make them firmer. Some kids just couldn't eat enough of them. Others, just like the crocodile with his bananas, were not so enthusiastic about the final product. But they all enjoyed using the hammer and imagining if we would fool the crocodile with our banana bonbons. Good reviews may come even from the kids who don't care for bananas. You can play with it as well -- nuts might be a wonderful addition, as well as any kind of dried fruit. Chocolate chips, to put on the top of bonbons. I'm not above taking my kids to the Happy Meal Place now and again, or indulging them in a Shamrock Shake. I am, however, above taking them for a lot of Shamrock Shakes. 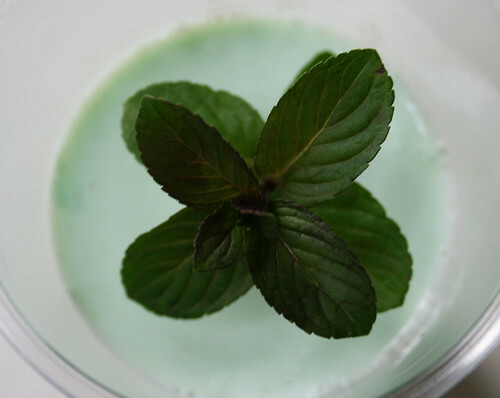 We whipped up this homemade version using fresh mint for natural flavoring. We even threw in a bunch of spinach, knowing full well that a dose of leafy greens doesn't magically make this healthy. It does, however, help us feel a little better about it. 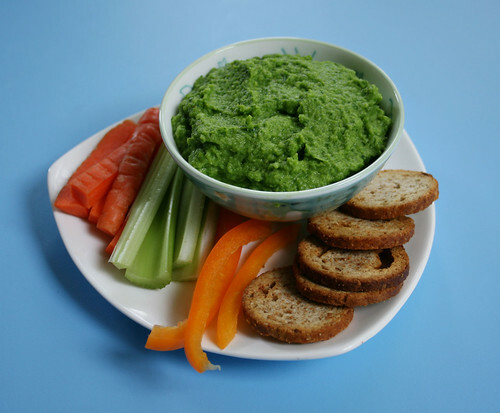 You can forgo the spinach, if you wish, but it's a fun way to play with veggies. For the record, I don't advocate hiding healthy stuff in kids' food, though I understand and appreciate why some parents do it. If your kid is open to experimentation, let her toss the leaves into the blender and taste the results. My older son, for example, hates spinach, but he loves making Brainy Brownies precisely because of the spinach and blueberry puree -- he thinks it's neat those ingredients can disappear so completely. Feel free to green this up with a bit of food coloring. If you're short on time, skip the steeping part -- but add more mint leaves to the blender. Warm milk (and half-and-half, if using) in a saucepan over medium heat, stirring, until mixture begins to steam. Remove from heat, stir in half of mint, and let steep in refrigerator at least two hours or up to overnight. 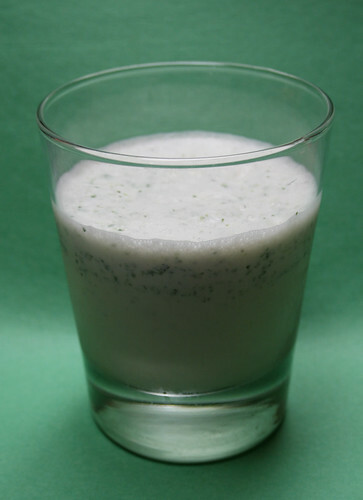 Pour milk-and-mint mixture through a fine-meshed strainer into a blender. 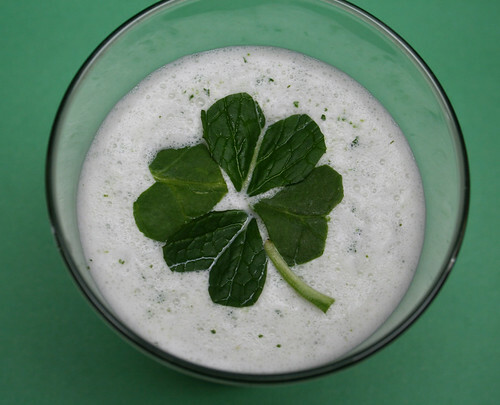 Add 2 cups ice cream, spinach, and a handful of mint leaves and blend to combine. Add more ice cream if mixture is too thin. Taste and add more mint if desired. Makes 2 to 3 drinks. Broccoli, Almond and Lemon Zest "Pesto"
This is so delicious that I ended up eating it on the top of a toast. Last week was crazy: Kids were enjoying a Winter break, one was sick and they were running around most part of the time. I just encountered peace in the kitchen, now and them baking friendly cookies to cheer up, trying new ingredients and developing new recipes. Above all things that came from the kitchen during the whole week, my favorite creation was this one. I shared some of it with Darienne and her boys. Some loved it, some didn't care for it. Also, it has other beautiful characteristics: it includes lemons - my latest passion- and almonds. Not to mention that it brings the wonderful broccoli. And all the goodness of those powerful foods. After some research about the origins of Pesto alla Genovese - my favorite Italian sauce- I found out that its name comes from the method used to prepare it - the old kitchen gadgets, the pestle and mortar. Not intimidated by tradition, though, and short of ingredients in my fridge and pantry, I needed something fresh to serve with my vegetarian feast. And tested this sauce. The black stone pestle and mortar I have were sitting on the countertop. And so was the food processor. The second won, as I was short of time. But I promised to myself that next time I will make it like my ancestors, using the pestle and mortar, and perhaps will go for the traditional recipe. In the meantime, I already reviewed this recipe, ate it again yesterday on the top of a toast. Perhaps tomorrow I will toss it on a delicious homemade pasta. Heat small skillet with 1 tablespoon olive oil. Add broccoli and garlic and shallow fry on medium heat for about 5 minutes. 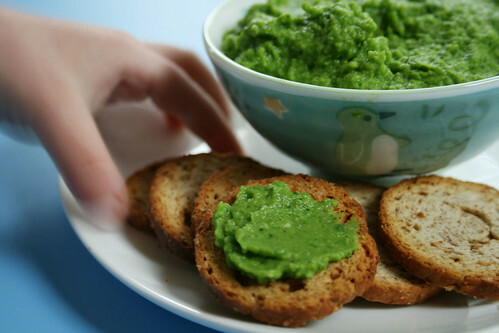 Add warm broccoli and all other ingredients in a food processor and pulse up to when it reaches a coarse texture. Add salt to taste. Add more olive oil and pulse more if you want it creamier. Dress it up with a few curls of lemon zest.